Guess what? 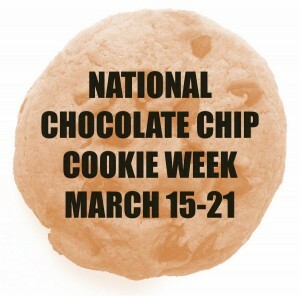 It’s National Chocolate Chip Cookie Week. No kidding, it’s really a thing. And just because you are trying to eat healthy doesn’t mean that you can’t afford to treat yourself from time to time. So in honor of one of the world’s greatest cookies, we’ve come up with a slightly healthier take on this national favorite! Mix the dry ingredients (flour to salt) and set aside. Cream together the butter, brown sugar, granulated sugar, honey, and vanilla. Add eggs and mix until smooth. Add the dry ingredients and thoroughly blend. Mix in the chocolate chips and pecans. Bake for 9-10 minutes. Allow to cool for 2-3 minutes before transferring them to a wire rack. Makes 48 cookies. **2 extra Tbsp of flour will make cookies puffier. Have you tried any healthy recipes lately? Share them with me in the comments and your recipe could be featured on the blog!